MBS Day Ahead: Which Side of the Market is Lying? A strengthening economy implies rising earnings/profits among companies and therefore, higher stock prices. The same strengthening also supports higher long-term interest rates. This is the incredibly logical, slightly oversimplified underpinning of the notion that stock prices and bond yields tend to move in the same direction. Indeed, we frequently see that correlation, but invariably, we see a departure from it at times. This results in questions about which side of the market is telling the truth. Now is one of those times, as seen in the following chart of S&P futures and 10yr yields. The chart above could be argued several ways. On one hand, we could use it to make a case for bond market resilience in the face of rising stock prices. That wouldn't be a bad takeaway actually. On the other hand, we could say that one of the two is going to cave-in to the desires of the other and move back in the other direction (i.e. stocks will fall back toward bond yields or bond yields will rise up toward stocks). On the OTHER other hand, we could choose the warm bowl of porridge and conclude that a certain set of underlying motivations periodically shows up with logical justification for such breaks in the correlation. But what underlying motivation could accomplish such a thing? As with so many of these questions, the answers are often found in the past. This isn't to say that the Fed is on the cusp of restarting its bond-buying program (although Powell confirmed, again, that the arrow is in the quiver when its needed). Rather, the Fed simply shifted into a much more market-friendly stance after seeing how poorly the stock market received the mid-December Fed announcement. And yes, I am breaking from my typical defense of the Fed's forthright decision-making in saying they are paying way more attention to stocks than they're willing to admit. Whether we're talking about QE in 2009-2014 (with reinvestments through present day) or simply a softer rate hike outlook and the dangled carrot of a higher terminal balance sheet (i.e. the Fed may leave more of its reinvestments in place than initially expected), a friendlier Fed is a rising tide that lifts all boats. In other words, neither side of the market is necessarily "lying" to you at the moment. Bonds have a reason to hold in a sideways pattern and stocks have some justification to edge back up toward late-2018 highs. This wasn't necessarily as easy to accept before last week's Fed events, although the undercurrents began swirling with various Fed speeches in the past month. Where does that leave us? The Fed will be the first to tell you: it depends on the data! 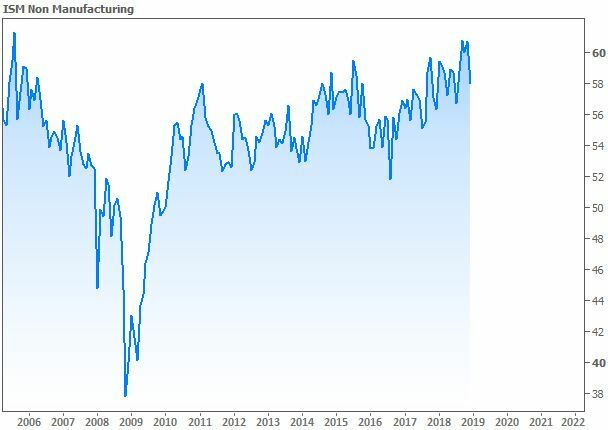 It seems we're done paying for the strong data from last Friday (NFP, ISM Manufacturing, Factory Orders, Consumer Sentiment) and can now move on to assessing new incoming data. In that regard, today's ISM Non-Manufacturing is the only truly big-ticket report of the week. It's been in a fairly linear uptrend for more than 2 years now. Because it's nearer its recent highs, markets would likely be able to forgive a downbeat report or two before freaking out too much.